In this captivating collection of poems from pastor Ken Gibble, readers will encounter the worries, hopes, sorrows, and joys that pour forth from the mouths and hearts of those around us. A Poetry of the Soul serves as a holy exchange, rising from the tension between heartache and happiness, doubt and faith, lament and praise. Let these poetic expressions bring a clearer understanding of what it means to be human and allow them to powerfully transform your life. 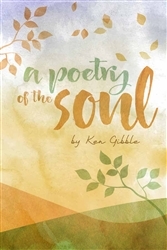 "Ken Gibble writes out of an artful understanding of God and humanity in this soulful collection of story-shaped poems. With the heart of a pastor and the pen of a poet, Gibble offers literate slices of life that will be both familiar and unfamiliar to the reader. This is truly the mark of the successful poet: to make the world both familiar and strange and thus invite deeper reflection, contemplation, and meditation. Gibble’s writing embodies a beautiful poetics of presence. This pastor knows how to lean in and listen to life. His poems, like all good writing, show rather than tell. Since we are indeed God’s poetry, the inspired pastor as creative writer, in touch with the extraordinary power of ordinary experience, invites us to read lived lives as wisdom literature. Most striking is the poet-pastor’s conclusions about what we will remember and what others will remember about us when our lives finally reach the epilogue." Ken Gibble has pastored Church of the Brethren congregations in Virginia and Pennsylvania. He is an essayist and poet whose writings have appeared in numerous periodicals and several books. I love this book of poems. When I received this book I opened it and began to read. I didn't look up again until page 32, when I had to catch my breath! I know this person! This is who is daily saving mankind from himself, kindness personified, the ER nurse, the teacher, the special person we have all met several times, if we are lucky. Ken Gibble, who has pastored in Virginia and Pennsylvania, gives us a look into "what pastors do", but goes beyond the doing, deeply into the feeling. He is not shy about his own times of doubt or inadequacies. Always the student, he learns from a lifetime of giving and loving how to accept the good and understand the weakness of all creatures. With great humor and self awareness he tends to his people and learns as much as he teaches. His poems about this life are told in easy language, comfortable. This is a long book for poetry, 147 pages, put into sections. Mr. Gibble's people will stay with you, maybe into your dreams, as I am sure he will, too.